Although there is no cure for arthritis of the shoulder, there are many treatment options available. Using these, most people with arthritis are able to manage pain and stay active. The head of your upper arm bone fits into a rounded socket in your shoulder blade. This socket is called the glenoid. A combination of muscles and tendons keeps your arm bone centered in your shoulder socket. These tissues are called the rotator cuff. There are two joints in the shoulder, and both may be affected by arthritis. One joint is located where the clavicle meets the tip of the shoulder blade (acromion). This is called the acromioclavicular (AC) joint. Where the head of the humerus fits into the scapula is called the glenohumeral joint. To provide you with effective treatment, your physician will need to determine which joint is affected and what type of arthritis you have. Rheumatoid arthritis (RA) is a chronic disease that attacks multiple joints throughout the body. It is symmetrical, meaning that it usually affects the same joint on both sides of the body. The joints of your body are covered with a lining — called synovium — that lubricates the joint and makes it easier to move. Rheumatoid arthritis causes the lining to swell, which causes pain and stiffness in the joint. Rheumatoid arthritis is equally common in both joints of the shoulder. Posttraumatic arthritis is a form of osteoarthritis that develops after an injury, such as a fracture or dislocation of the shoulder. Arthritis can also develop after a large, long-standing rotator cuff tendon tear. The torn rotator cuff can no longer hold the head of the humerus in the glenoid socket, and the humerus can move upward and rub against the acromion. This can damage the surfaces of the bones, causing arthritis to develop. The combination of a large rotator cuff tear and advanced arthritis can lead to severe pain and weakness, and the patient may not be able to lift the arm away from the side. Avascular necrosis (AVN) of the shoulder is a painful condition that occurs when the blood supply to the head of the humerus is disrupted. Because bone cells die without a blood supply, AVN can ultimately lead to destruction of the shoulder joint and arthritis. Avascular necrosis develops in stages. As it progresses, the dead bone gradually collapses, which damages the articular cartilage covering the bone and leads to arthritis. At first, AVN affects only the head of the humerus, but as AVN progresses, the collapsed head of the humerus can damage the glenoid socket. Causes of AVN include high dose steroid use, heavy alcohol consumption, sickle cell disease, and traumatic injury, such as fractures of the shoulder. In some cases, no cause can be identified; this is referred to as idiopathic AVN. Pain. The most common symptom of arthritis of the shoulder is pain, which is aggravated by activity and progressively worsens. If the glenohumeral shoulder joint is affected, the pain is centered in the back of the shoulder and may intensify with changes in the weather. Patients complain of an ache deep in the joint. 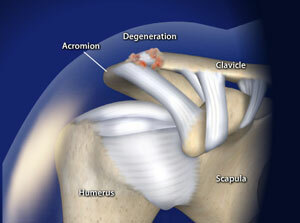 The pain of arthritis in the acromioclavicular (AC) joint is focused on the top of the shoulder. This pain can sometimes radiate or travel to the side of the neck. Someone with rheumatoid arthritis may have pain throughout the shoulder if both the glenohumeral and AC joints are affected. Limited range of motion. Limited motion is another common symptom. It may become more difficult to lift your arm to comb your hair or reach up to a shelf. You may hear a grinding, clicking, or snapping sound (crepitus) as you move your shoulder. As the disease progresses, any movement of the shoulder causes pain. Night pain is common and sleeping may be difficult. X-rays are imaging tests that create detailed pictures of dense structures, like bone. They can help distinguish among various forms of arthritis. X-rays of an arthritic shoulder will show a narrowing of the joint space, changes in the bone, and the formation of bone spurs (osteophytes). > Rest or change in activities to avoid provoking pain. You may need to change the way you move your arm to do things. > Physical therapy exercises may improve the range of motion in your shoulder. > Nonsteroidal anti-inflammatory medications (NSAIDs), such as aspirin or ibuprofen, may reduce inflammation and pain. These medications can irritate the stomach lining and cause internal bleeding. They should be taken with food. Consult with your doctor before taking over-the-counter NSAIDs if you have a history of ulcers or are taking blood thinning medication. > Corticosteroid injections in the shoulder can dramatically reduce the inflammation and pain. However, the effect is often temporary. > Ice your shoulder for 20 to 30 minutes two or three times a day to reduce inflammation and ease pain. > If you have rheumatoid arthritis, your doctor may prescribe a disease-modifying drug, such as methotrexate. Your doctor may consider surgery if your pain causes disability and is not relieved with nonsurgical options. Arthroscopy. Cases of mild glenohumeral arthritis may be treated with arthroscopy, During arthroscopy, the surgeon inserts a small camera, called an arthroscope, into the shoulder joint. The camera displays pictures on a television screen, and the surgeon uses these images to guide miniature surgical instruments. During the procedure, your surgeon can debride (clean out) the inside of the joint. Although the procedure provides pain relief, it will not eliminate the arthritis from the joint. If the arthritis progresses, further surgery may be needed in the future. Shoulder joint replacement (arthroplasty). Advanced arthritis of the glenohumeral joint can be treated with shoulder replacement surgery, in which the damaged parts of the shoulder are removed and replaced with artificial components, called a prosthesis. Hemiarthroplasty. Just the head of the humerus is replaced by an artificial component. Total shoulder arthroplasty. Both the head of the humerus and the glenoid are replaced. A plastic “cup” is fitted into the glenoid, and a metal “ball” is attached to the top of the humerus. Reverse total shoulder arthroplasty. In a reverse total shoulder replacement, the socket and metal ball are opposite a conventional total shoulder arthroplasty. The metal ball is fixed to the glenoid and the plastic cup is fixed to the upper end of the humerus. A reverse total shoulder replacement works better for people with cuff tear arthropathy because it relies on different muscles — not the rotator cuff — to move the arm. Resection arthroplasty. The most common surgical procedure used to treat arthritis of the acromioclavicular joint is a resection arthroplasty. Your surgeon may choose to do this arthroscopically. In this procedure, a small amount of bone from the end of the collarbone is removed, leaving a space that gradually fills in with scar tissue. Recovery. Surgical treatment of arthritis of the shoulder is generally very effective in reducing pain and restoring motion. Recovery time and rehabilitation plans depend upon the type of surgery performed. Complications. As with all surgeries, there are some risks and possible complications. Potential problems after shoulder surgery include infection, excessive bleeding, blood clots, and damage to blood vessels or nerves. 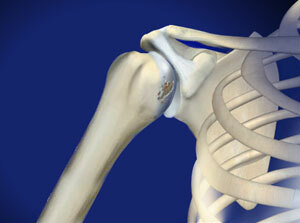 Research is being conducted on shoulder arthritis and treatment. In many cases, it is not known why some people develop arthritis and others do not. Research is being done to uncover some of the causes of arthritis of the shoulder. Joint lubricants, which are currently being used for treatment of knee arthritis, are being studied in the shoulder. New medications to treat rheumatoid arthritis are being investigated. Much research is being done on shoulder joint replacement surgery, including the development of different joint prosthesis designs. The use of biologic materials to resurface an arthritic shoulder is also being studied. Biologic materials are tissue grafts that promote growth of new tissue in the body and foster healing.